What is a Domain Name/URL? 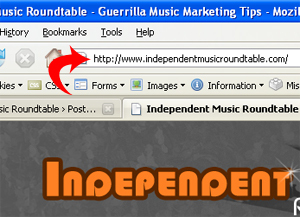 A Domain Name or URL (Uniform Resource Locator) is the address of your Website, for instance, independentmusicroundtable.com. Your Domain Name acts as the text name corresponding to the numeric IP address of a computer on the Internet, usually the web server your Website is hosted on. A domain name must be unique and should be the name of your band. If your band’s name is already taken, try adding “band” or “music” to the end. In order to get a domain, you must register a domain of your own. Many Web Hosting plans will supply this service for you. Take the time and get a unique Domain Name. Don’t send people to a Pure Volume or MySpace web page. You need your own Website which should include several pages. Your material is too valuable to be crammed into one elongated web page. Basically, Web Hosting is a service that provides storage for your Website with a high-speed Internet connection. Your web content is then accessible from anywhere in the world. Renting space on a web server is much like renting an apartment, however for a nominal fee. This monthly fee provides to you a certain amount of space on a web server depending on your particular needs. ***The most fitting and inexpensive way is Shared Hosting. As a band, your choice should allow a very high limit when it comes to the amount of data that can be transferred every month because your average visitor will download or stream music on your website. My highest recommendation is 1and1.com. I personally host numerous sites with 1and1.com and have had little or no problems. They offer plans for as low as $3.99 a month which includes your Domain Name and 600 e-mail accounts. Step 2 “What should my website include?” tomorrow! !